Puck, the Faerie Dragon, is a ranged intelligence hero notorious for her ability to evade capture and cheat death on the regular, while disrupting her enemies with an array of spells. 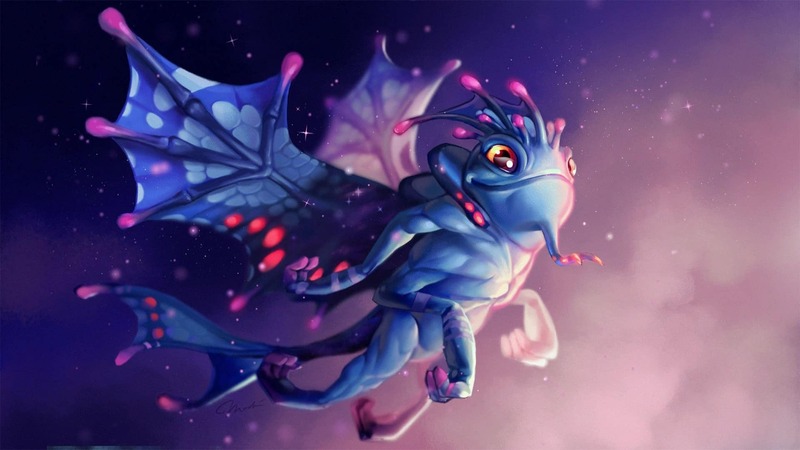 Puck is one of the most mobile heroes in all of Dota 2, able to confuse her opponents with unpredictable moves. This is done primarily through her first ability, called Illusory Orb. Upon cast, Puck projects an orb of light, which travels in a straight line in front of her for a set distance. Any units that the orb comes into contact with get hit with magic damage. More importantly, Puck can teleport to the orb’s position at any time while it is active, thus serving as a soft “blink” effect. Illusory Orb can be used for initiations and escapes alike, making it a very versatile spell. Illusory Orb is commonly paired with her third skill Phase Shift, which causes Puck to temporarily disappear into another dimension—avoiding all damage and spell effects while doing so. Puck can also avoid projectiles with Phase Shift, which makes it far easier to avoid harassment in lane. Phase Shift is truly what forms the core of her elusiveness, and it takes sharp game sense and a good amount of mechanical skill to make the most out of it. Surprising as it may be, Illusory Orb’s synergy with the rest of Puck’s kit doesn’t stop there. The mobility afforded by the Illusory Orb goes hand-in-hand with Waning Rift, her second ability. Upon activation, Waning Rift deals instant magic damage to all enemy units within a 400 unit radius, which starts from Puck herself. On top of that, Waning Rift silences these units, preventing them from casting spells for up to 3.5 seconds. It also goes well with her ultimate ability, Dream Coil. When Puck uses Dream Coil, it latches onto enemy heroes within its area of effect, binding them to the center of the coil for up to six seconds. Should these heroes move a set distance away from the coil, their tethers will snap, dealing magic damage and stunning them for a moderate duration. Dream Coil essentially forces the enemy team to either stand and fight, or take the snap stun and damage trying to run away. From her kit and design, it becomes clear that Puck is meant to be played as an offlaner or a midlaner. Her mobility and disruptive abilities also allow her to be an effective initiator, setting up kills for the rest of her team. Likewise, her mobility makes her ridiculously difficult to take down, serving as a major headache for her enemies to deal with.But with all her strengths come weaknesses, just like with any other hero. For one, her effectiveness depends quite a lot on her cooldowns, and getting caught in no man’s land without Phase Shift or Illusory Orb to escape with basically leaves her dead to rights due to her extreme fragility. Silence effects and hard disables are her worst enemies, as well, for they prevent her from using her entire arsenal. To top it all off, Puck also has a very slow turn rate, which hampers her escape attempts surprisingly often. Puck really only has one skill build, which focuses on getting her magic damage potential to its maximum as soon as possible. While all of her abilities are important and useful throughout the entire game, Phase Shift is generally left alone until the mid to late game due to the fact that most of her damage comes from Illusory Orb and Waning Rift. That said, Illusory Orb is typically maxed out first, as it is your longest range nuke and thus the safest. Illusory Orb is also used to farm creep waves early on from a distance, fueling Puck’s item progression. Waning Rift is given second priority, as it does require Puck to be close to her enemies in order to use it. The items she needs to have in order to do so safely usually come around in the mid game, which is why it should be left at Level 1 until then. Dream Coil, on the other hand, should be taken at every opportunity in order to maximize its stun duration and damage right away. There is one item that Puck really, really needs to take her game to the next level, and that item is called Blink Dagger. Most of your activity in the laning phase will revolve around farming for it, and the sooner you get it the sooner you can start terrorizing the lanes with your abilities. The reason that Blink Dagger is so good on Puck is because the duration of Phase Shift at max level is half a second longer than Blink Dagger’s cooldown upon taking damage, essentially making the item a guaranteed escape for her. Before getting to that point, though, there are some preliminary pickups that you should get—unless the laning phase is going so well that you can afford to get a Blink Dagger as your first real purchase. Power Treads is one, as it gives you the extra stats you need in order to survive the early game while preserving your momentum for the mid game. A Bottle is also a good pickup for Puck, as she can easily control the rune spawns using Ethereal Jaunt (Illusory Orb’s teleport sub-ability). Once you have those squared away, the Blink Dagger comes next. After purchasing a Blink Dagger, pretty much all of Puck’s items after that will be situational pickups. A personal favorite of ours is Linken’s Sphere, which gives you more time to execute an escape against heroes that rely on single target spells. The additional stats and passive regeneration help plenty as well, and enable you to gank quite often. Veil of Discord is another excellent choice, as it gives your two nukes a lot of extra oomph. If you need movement speed and a handy single target disable, Eul’s Scepter of Divinity is there to provide those two things for a reasonable cost. Aghanim’s Scepter is perfect for when you have teammates that can displace enemy heroes that are caught in Dream Coil. Picks like Keeper of the Light and Vengeful Spirit work well in this regard, forcing tether snaps that pierce magic immunity and stun for nearly five seconds at a time. Scythe of Vyse can help control particularly problematic targets, and can easily swing the momentum of the game in your team’s favor. It is quite expensive though. Shiva’s Guard can be used against physical DPS carries that rely on their attack speed to deal damage, and also adds another area-of-effect nuke to your arsenal. Puck’s teamfight rotation is simple on paper, though it does take a lot of creativity and game sense to pull off well. This is because Puck becomes quite vulnerable after spending her cooldowns, which means that Illusory Orb typically must be used as both a nuke and a quick escape after initiating. That said, the rest of the combo is fairly intuitive. Using either Blink Dagger, jump on top of as many enemy heroes as possible, then hit Waning Rift as soon as you get there. Follow this up with Dream Coil, then Illusory Orb to deal damage to as many heroes as you can. Use Ethereal Jaunt to get to a safe distance, then assess the situation: should you go back in to deal damage with your regular attacks, or stay back and have your teammates take care of cleanup duty? Either way, you’ll want to keep an eye on your cooldowns so that you can use your spells as soon as they’re available again. Just as she can disrupt your team with her abilities, so can you and your teammates put a stop to Puck’s flow and rhythm. Hard disables and silences destroy her, causing her to become totally helpless. Her mediocre attack speed and middling damage (at least, before unlocking the Level 15 talent) cannot save her if her spells are locked away, so it is always a good idea to pack instant silences against her. Puck is also reliant on a good start to the game, for she has trouble playing catch-up if she is set back significantly in the laning phase. Rotating over to her lane and disturbing her farm or outright killing her can be very much worth it if the enemy team’s gameplan revolves heavily arond Puck’s initiations. Without the gold and levels she requires, Puck will fall off the map early and will basically become dead weight to her team.